GREAT NEWS - I think????? Thought I would give a little update about my hip. It has been the weirdest thing. Sunday I was worried about a stress fracture and today, Monday, no pain at all. I iced 4 times on Sunday. I got up this morning and did my 20 min of yoga and no pain. Later in the morning, it was raining and I jogged across the yard to keep from getting drenched and no pain. So thankful and so excited. It was a warning sign that I will heed. So today Chad(hubs), Scarlett(doggie) and I walked for 30 min. I iced again today and will ice tonight after the Saints game. Will test the waters a little on Wed with a 3 mile running attempt. We are at the Alumni House watching the Saints game. I am too ADD to watch 3 hours of football so I brought my laptop to catch up on all the blogs and to give you guys the good news. First the ugly and bad news. This morning I woke up with my right hip hurting. I thought no big deal, I will just take a warm shower and it will loosen up and it will loosen up more when I join my friend M.C. for an easy run. So after the shower, it felt ok initially, but just a few minutes later it was hurting again. I took a few jogging steps in the house and immediately knew I had to call MC to cancel the run. I HATE that! So today I have been icing off and on, I did go for a SLOW 30 min walk which seemed to help, but certain movements hurt. So...... I am so glad that I ran hard yesterday. While driving 2:20 min. to the race, I was plotting out my strategy for the race. Over the past year or more, I have really worked on starting out slow and picking up the pace later. I really like this for many reasons. The most important reason is, I feel so much better throughout the race. In the past, I always went out too fast, and then just died throughout the race, and it was painful. The slower start feels SO MUCH BETTER. The other reason is that I have come to LOVE being very technical about my running. It's somewhat of a game to really try to hit my paces, and I think it distracts me from some of the pain because I am concentrating so hard on hitting the numbers. So my plan was plotted and looked like this. During the race, as I hit those numbers, I am a HAPPY CAMPER. After the race, when I am reviewing the Garmin data, it is just as good as running a PR, if I have hit my numbers. If I have a plan, and it comes together on race day, that makes me feel good. I started running by the numbers a little over a year ago on long runs, some would be progression runs, others would be 1 fast mile, 1 slow mile - at predetermined paces etc. For me it's an entertaining game. This is when my addition to the Garmin increased, but it's fun. Without the Garmin, I can not pace at all. From our previous discussions, I know most of you are thinking if you hadn't predetermined your numbers you could have run faster. NO, trust me, that was all that I had on SAT. Yesterday, I mentioned that I had some help during this race. I am not sure what mile I was at, but I am thinking it was around 6-7. I was running and I noticed a young man beside me. He looked very young and I was so impressed that he was running a half marathon. So I asked him how old he was. He says 17. So we began chatting. He is a high school cross country runner and this was his first half marathon. A friend was supposed to join him but she bailed on him. We talked, off and on throughout the rest of the race. I was trying to hold on and to maintain our pace, from what he said, he was doing the same. With 2 miles left, I told him that I would try to stay with him, but if he could go ahead, he needed to go. He looked so comfortable, I thought I was holding him back. He says, "you are pushing me, this is all I have" I said good, you are pushing me too so we are helping each other. I truly believe that I would have fallen off the pace if he hadn't decided to run the race with me. It was really neat. Normally, I do not do a lot of chatting during a race. Today, I was able to chat, stay on pace, and maybe help someone finish their first marathon a little faster than he would have finished alone. C.C. if you are reading this. CONGRATS! I am proud of you. He won 3rd in his age group. He has also lost 60 lbs in the recent past, through running. So neat, so inspiring. He also helped me to my PR. Thanks CC! 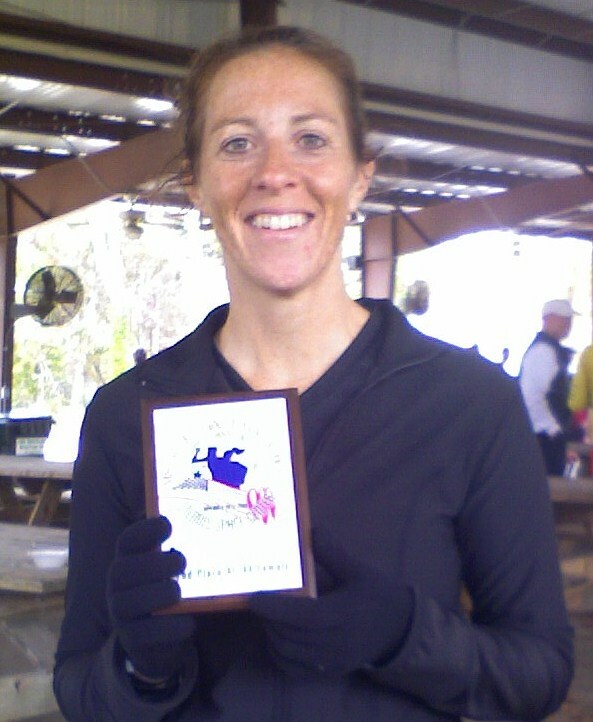 2nd in my age group. On another note, Jen and I had the opportunity to spend some time together. 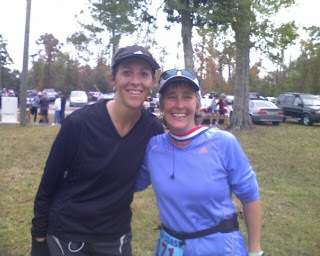 We talked a little prior to the race while registering, waiting in the potty line, pre race prep, etc. After I finished the race, I went back to find Jen to try run the last bit of the race with her. When I made it to her, she had 1 mile left. She was smiling and running a great pace. She had raced a five mile race on Thurs. and PR'ed by 2 minutes over last year's time. In addition to that, she was very close to her PR in the half on Sat. She ran a smart race and has many many more PRs in her bright running future. Great race Jen. I enjoyed the visit. I also was able to chat with Robbie and Kent before and after the race. Robbie won the GrandMasters in the 5k. Congrats Robbie! Keep it up! So a great day at the races! Fun! Meg - it was very interesting today. I spoke with someone that I met last year at this race. Last year we ran around the same time for the half, I actually finished 2 min. ahead of her at this race, but at a race in Dec. 08 she got me at the very end of the race, but again, we were running around the same times. Today she ran around 1:41, I think that's what she said. I congratulated her for moving to another level in her running. She said "you know, when I stopped trying so hard, I started running faster. It's been really weird, but most of the time, I don't even look at my watch anymore, unless it's just a look and then to say, hey I'm running pretty good today." Ok, I am VERY impressed with her, and the new training philosophy, but for me, for now, that's not gonna happen. I immediately thought of you and thought how interesting it is that 2 people have confirmed these techniques work, but I am unwilling or unable to let go and give it a try. For racing = Slave to the Garmin! Live and Die by the Garmin! "My name is Ginny and I am a Garmin addict! I need therapy, I know. From what I am told, the half marathoners were not supposed to get medals, but as it happened, the printing company made a boo boo. So the "halfers" received these funny collector's medals. Love it! But we really ran the HALF matathon. So I have run my mileage for today (5 miles easy), I have visited, and had a big lunch with dessert. Now time for a lazy afternoon. Now my focus is on Sat. 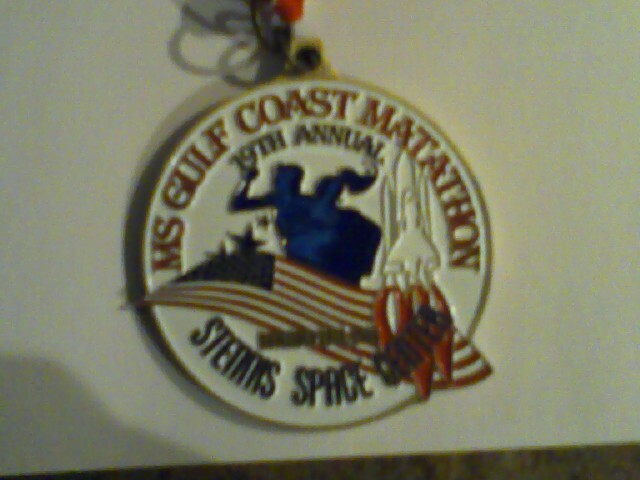 I will be running the Stennis Half Marathon. I have run this race several times, (full & half). It's more or less become a thanksgiving weekend tradition. I like to race 2 days after the Thanksgiving feast. Makes me feel like I am "working it off." Last year it was hot and HUMID for this race. I have said all summer, I would not run this one, this year if it was under the same conditions as last year. Ahhhh, I'm in luck. It's going to be chilly. Just the way I like to run a race. Very Exciting! 1. I'm kind of addicted to racing. 2. If I decided NOT to race the half this Sat, then 2 weeks from now, the weather may be hot and humid (I do not run well under those conditions). Then I would be upset that I had good weather conditions for the half and didn't go for the PR. 3. Anything can happen in the next 2 weeks. Race while you can, I say. 4. I just PR'ed in the full marathon, and I am not ready to go under 3:49, so the half marathon pr is more doable and realistic, at this time. training for the marathon - I have kept my mileage up this week. If I was focused solely on the half marathon this Sat., I would not have run an 18 miler on the Sunday before a Sat. race. Also, I would have tapered my mileage to really prep for the half marathon. *If I did not "race" it, I would be sad and questioning why I let the possibility of a PR pass me by. Yes, I'm a PR junkie. I crave it and soon I will be old. So again I say..... a flat, fast, a cool half marathon ....I'm Going For It! "Why put off until later, what you may be able to do on Sat." The possibilities are very exciting! I think I have 8:19 pace in me! I am appreciating Amanda's Holiday Bootie Buster Challenge. It has me focusing on my fruits and veggies and making sure I get at least 7 per day. This is a good thing, especially this time of year. Runner's checklist - has it really come to this? OK, so I am 41, but really, that is not really old is it? 40 is the new 30 right? What I am confused about is my lack of memory. Today, I head out for my 18 mile run and somewhere between miles 3 and 4 it just pops into my head (not from pain, luckily) "I forgot the BodyGlide!" What? You have to be kidding me? How can you forget the BodyGlide? That is like forgetting your Garmin, your Ipod, your Gu's, it just should not happen. So apparently, I need a Long Run Checklist. Look over it, I probably forgot something. for me - Nathan 5k pak which holds Gu (chocolate for me), Chap stick, gum, sometimes Chomps, a plastic baggy with money (just in case), emergency contact info - name, phone number of hubby, phone of Mom & Sister, allergies(penicillin) - so many texting you never know when you will be run over, and sometimes some tissue - you never know what will happen. Garmin w/ heart rate monitor but mine died - Bummer! Go drop waters - for shorter runs a CamelBak fuel belt. I think that's it! Dang, if I unloaded some of this stuff I could run a lot faster. I ended up lucky today, no real damage for my lack of memory in applying the most important Body Glide. This week I ended with 45 miles of running, 7 miles walking, a yoga class, and home yoga -10-15 min. most days of the week, some core work and push-ups. Quality runs this week - hill repeats in the rain, 7 miles with 5 miles @ tempo 8:06 average, and today an 18 mile progression run @ 9:03 average. 2 miles w/u @ 9:24 avg. 8 miles @ 9:10 avg. When I made it back from my run, hubby had ice ready for my ice bath, my sweatshirt and warm hat ready, and prepared my hot tea. How sweet! Blog time is up - off to Walley World! First - woke up today with no pain at all from my fall yesterday and no soreness. Very thankful! So this afternoon I was a little very aggravated with work. I had wanted to get my workout in around 3:00 or 4:00 but it was not to be. My plan was to run 200s. I figured I would warm up and see if I felt any pain in my ankle and then decide from there, but the plan was 200s, if no pain. As I was driving home today, near my house, I drove down one of my hill repeat hills and started thinking about hill repeats. By the time I could get out the door it was dark. So I head out for my warm up and I am thinking, I will warm up and come back to the hill by my house. Then I make it further down the road and decide maybe I will go on out to the 2 mile mark and do 200s on the flat road, just past 2 miles, I am thinking flat will be easier and safer in the dark. So I get to the spot and the 5:30 traffic is bad, it's dark, not a good option. Back to hill repeats! Decide to head back toward the house to run the hill. When I get to my first hill heading back, I change my mind again and decide this is a good hill. So Wishy Washy today! I felt like Tinalocks a few weeks ago trying to find the perfect hill. I did not find the perfect hill, the footing was rough in spots, and it was very dark. So I ran the hills, but it wasn't the workout I planned. It was dark and the road was rough. I was nervous about running in the dark - scared to twist my ankle after yesterday. I ran the hills at a much slower pace than I would normally run. I looked at the weather radar before leaving the house and I knew the rain was close, but I was determined and could not stomach the thought of 7 miles on the treadmill today. In addition to all my complaints listed above, now it's raining too, making the road slippery and sloppy. So I did it! Yes, I couldn't make up my mind, it was sloppy, it was dark,I was soaking wet BUT... I got my 7 miles for the day and I ran some hills. Physically, I am not sure how far it will get me, but mentally a BIG boost. It wasn't what I planned or what I wanted, but I did what I could do today and I did it pain free. Hooray for that! Going for 45 miles this week! Childhood quote lives again today! Isn't it funny how some things we say when we are kids seem to live with us forever? Through the years, occasionally, someone in the family will bring it up and everyone has a good laugh. We'll today, the saying would be perfect. I was walking to my car to get my sunglasses so that I could head out for my run. I stepped in some mud and my feet went flying out from under me. I landed on my tail bone. I immediately stood up. My father-in-law was near by and he asked if I was ok. "Yes, luckily, I think I am ok," I said to him. (shamed, of course) With mud on my hands, buttox, and shirt, I headed back in to change clothes. As I walked inside I noticed that I hit the ground pretty hard. I could feel it in my tail bone, the lower part of my palm has a brush burn where I tried to catch myself, and I even noticed my teeth felt a little funny. I guess my teeth hit together pretty hard upon impact. I changed clothes, put them in the wash, and walked around a little just to make sure I was ok. Back on track, and ready to head out for a run. Today, I walked 1 mile, ran 6, and walked 1 more mile. The walk was fine, feeling very lucky about my fall. As I started running, I did notice a pain in my ankle. After about a half mile it eased up, but I am thinking something happened in the fall. I don't think it's anything major, but today I will ice it. (you know I have to ice if I feel anything, right?) As I was running, the memory of "oh my root" came into my mind and I thought it was the perfect quote for the "seat drop" that I did today on the hard surface. "I'll call it "tree" if I want to!" Yes, I drove them crazy with this quote. Made it back home from the run, took a shower, headed to Walley World, and back to blog. As the day goes on, I can feel my tail bone area, or very low back is bruised. I hope it's only a bruise. Another great reminder to be happy, and thankful each day you can go out for a walk or a run. The next run is not guaranteed. Funny thing on the run today. Today, I was finally able to do the my "bridge loop" again. 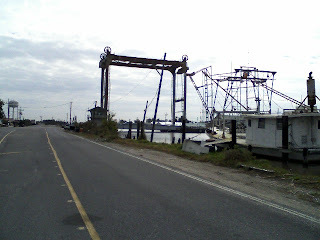 For most of the summer and fall, 2 of the bridges, over the bayou have been "closed" for repairs (although in South La it is said that the bridge is "open" when you can't go across. I say that it is "closed" when you can't go across, because it is closed for vehicle traffic. Both are correct in a way. They open the bridges for boat traffic to pass. So my husband and I agree, both are correct. He is a native Louisianian and he laughed at me the first time I said the bridge is closed - he says no it's open. It's confusing!) As I made it across the bridge, and I'm running up the other side of the bayou, I notice a motorcycle is slowing down, to roughly my pace. As he gets close to me, I look over at him to see what he is doing. He looks at me, smiles and says "8 mile per hour" I laugh and wave and he takes off again. 8 mph! Ha Ha - I soooo wish I could run 8 mph on a recovery run. That would be sweet! (I was actually @ 6 mph) Funny! Sat. - was supposed to go to Gulfport to run a 5k, my car had other plans, dead battery. Not happy, but decided a tempo run would be grand. Haven't run a tempo run since St. George, other than 5ks. I wanted to run 5 miles around 8:00 per mile or just over. I could only make 4 miles @ tempo. The 5ks are great, but I need those longer tempos for the marathon. Dual training is fun, but not ideal. I have been running speed work for 5ks. I have been running long runs and total weekly mileage for the marathon. While I am having fun doing both, I do it knowing that both areas will suffer the consequences. I will not run my 5ks as fast as I might if I was focusing my entire training week on them. Also, I will not be totally ready to run Huntsville, because I am lacking those longer, true marathon tempo runs. O'well it's fun! Ended up averaging 8:51 pace for the 10 miles which includes 2 miles w/u, 4 miles tempo around 8:15 average, and then running whatever I felt like for 3, and 1 mile c/d. I feel good about getting some type of longer tempo run in. I need those the most for marathons. I will get focused when I start training for Boston, until then, dual training it is! What a great weekend. Thurs. my Mom, Linde(sister) and I headed to Gulf Shores, AL to meet Chad and Jay and his family at the Captain's Meeting to get ready to "kick off" the tournament on Friday. 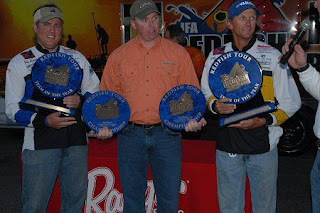 This was a 2 day, year-end Championship Tournament for the IFA . On Sat. the 2nd day of the tournament, I went to watch the boats pass by at the ICC @ LuLu's in Gulf Shores and then I headed to Mobile to run a 5k. Last week, you may remember that I ran 24:08. This week's goal was to go under 24:00. It is a GREAT course, flat with a slight downhill slant coming back to finish the race. I ran 23:45. After the race I went to A Spot of Tea and had a nice breakfast. The restaurant is on the race course. They also had a 10k which I normally run, but this year, for the first time, decided to run the 5k instead. So I had breakfast while watching the 10k runners finish the race. Then I started heading back to Gulf Shores. 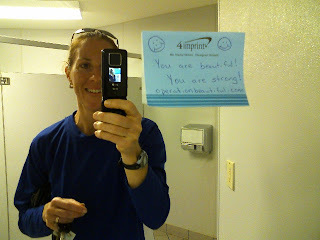 I stopped to use the potty and posted this nice note in the bathroom. This is such a neat thing to do and is part of the POTM Challenge (piling on the miles). When I made it back to Gulf Shores - lunch time - yay! So Mom and I headed to lunch at a cafe that is on the beach. We had lunch and then it was time to head back to the Sat. 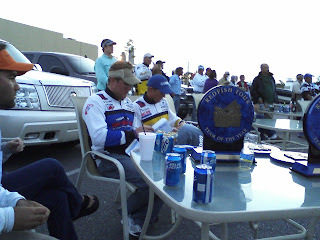 redfish tournament "weigh-in." 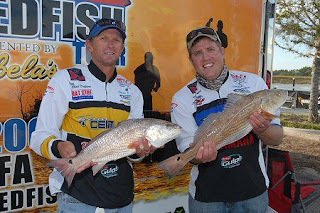 Chad and Jay had a great tournament. They finished the championship tourney in 2nd place. They had already won the Louisiana Division earlier in the year. Sat., they captured the Team of the Year award for the 2nd year in a row (1st team to ever repeat, TOTY award) They won almost $20,000 in awards. Awesome! As we near the end of 2009 Chad and I both are so excited about the year. He had a great tournament fishing year, and I have a another great running year. We are so blessed! Adding up the winnings. That goes to the Susan and Ginny, your loving wives, right? Today I officially start the POTM (Piling on the Miles) challenge that Bobbi (www.nhershoes.blogspot.com) and Caitlin (www.HealthyTippingPoint.com) have started to help to ramp up the mileage in order to keep the holiday pounds away. It can be walking or running. So today I walked for 4 miles. I have had 2 hard running days, so today, I needed to take it back a notch to get ready for Tues. track (yay, Tues. track) Gonna run some more 200s again on Tues. FUN! This morning I started the day with some yoga while my coffee was brewing and later in the morning I went to yoga class, and this evening, just before dark I went for the walk. This pic didn't turn out nearly as great as the view was, but it was beautiful. 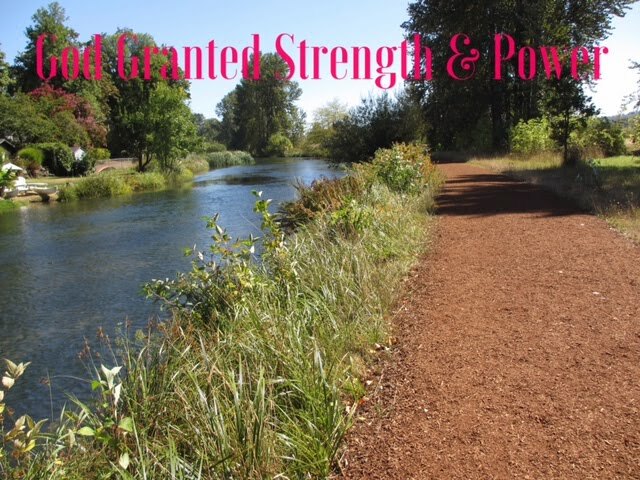 I am so thankful that I can get out and enjoy the scenery on a run or a walk. 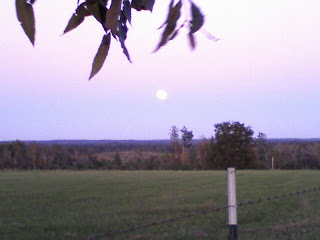 By the time I made it home it was dark, the full moon was bright, and I just had to do some "full moon salutations" to stretch out after my walk. The weather was great today and is supposed to be nice all week. The yoga and walk - awesome! The email from registration@baa.org - PRICELESS! I donated and received a shirt a few weeks ago, but I didn't realize this race was one of the races that many Mary Claire supporters would be at, and wearing the Miles for Mary Claire shirts. It was so great to see all of the supporters. Mary Claire has been blessed with strong and loving parents. So at 8:00 exactly, we were off and running in support of Mary Claire. There were around 80 runners I am told. The course was an out and back that had a couple of turns, and a couple of sharp curves in the road. I enjoyed the course, mostly because it was new (good choice). I ended up running 24:08. I WORKED really HARD for that 24:08. That was all I had today. The weather was around 54 degrees to start with a real feel of 51 degrees. The last 5k that I raced before St. George, the weather was 74 degrees with a real feel of 83 degrees and I ran 23:27. Apparently St. George is still showing it's effects, but that's ok. I am back at the track, and I hope to get faster over the next few weeks. I ended up winning the ladies race. All of the faster ladies decided on the other races. This weekend as mentioned we had 3 5ks and a breast cancer walk in the area. It sounds like I am in a huge area, but no, it's actually a small city. What a great feeling the afternoon after a 5k. I just feel so good. The endorphins are flying around like crazy and send me up in the clouds. Racing hard is the only way to get the feeling, so yes, I'm addicted to racing. Sat. afternoon I headed down to Biloxi, MS to see Riverdance. For years,I have wanted to see this show, so today was the day. Lucky for me the sun came out, and it was a great day for a drive. Lucky me again because I went to the Coast solo. When I made it to the ticket office she asked how many tickets, "one", oh she says let me make a call, we may have one for you. Yippie! One free ticket just for me. You may recall on Monday a nice lady gave me a free pumpkin spice coffee, and today a free ticket to Riverdance. Nice! The group that donated the ticket was from Pennsylvania and someone in there party canceled at the last minute. She was so sweet. The show was great. It would have been worth the price of admission. 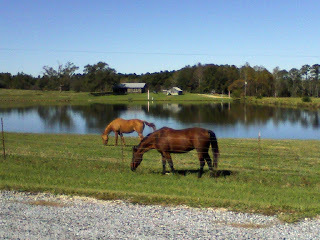 Today, under beautiful sunny cool skies, I headed out for a 10 mile run. I didn't get started until around 9:30. It's been many months since I could delay a long run until that time in the morning. I ended up making it 11. I felt great for most of the run. I had no plans for the run other than to be sure to, NOT run too fast. I ended up running 9:20 pace and felt good doing it, except the last few hills did become challenging. This afternoon I finally managed to get a couple of chores done in the yard that have been on my 2do list, and bugging me. What a great weekend! Sad it's over so soon. Missing my hubby. Last tournament coming up this weekend in Orange Beach, AL. I hope to be heading to Gulf Shores later in the week. Can't wait!